The Dominican Republic [has] not been known in my lifetime as having world class academic abilities. I mean a lot of those kids come from rough backgrounds and have not had opportunities academically that other kids from other countries have. Baseball is like any sport. It’s mostly instincts. A sports writer who covers baseball could go up to [Chief Baseball Officer for the Arizona Diamondbacks] Tony Larussa and have a real baseball argument and Tony would listen and it would seem reasonable. There’s not a single NFL writer in the country that could diagram a play for [Patriots head coach] Bill Belichick. We get caught up in this whole thinking man’s game. That Cowherd’s careless causality of the Dominican, educational opportunities, and the presumable lack of intelligence required to play baseball warranted a response is indisputable. It’s the conformity of the criticism, however, that is of most interest to this post. Intriguingly, no attention has been given to the second part of his rationale, the juxtaposition of football against baseball as the “thinking man’s game.” In his sport fable, Cowherd positions Patriots head coach Bill Belichick as the knight in shining armor. What is most troubling about this comparison is not simply that Cowherd plays up an historical ideal laden with connections to nationalism, Whiteness, war, and imperialism at the expense of Dominican players, but also that he does so at the expense of the racial and historical complexities of the game of football itself. In doing so, he prevents a more nuanced understanding of race, class, geography, and sport through the prism of American football. By not highlighting the dangers of this mythology, Cowherd’s loyal listeners aren’t the only ones following the herd. So, too, are his critics. 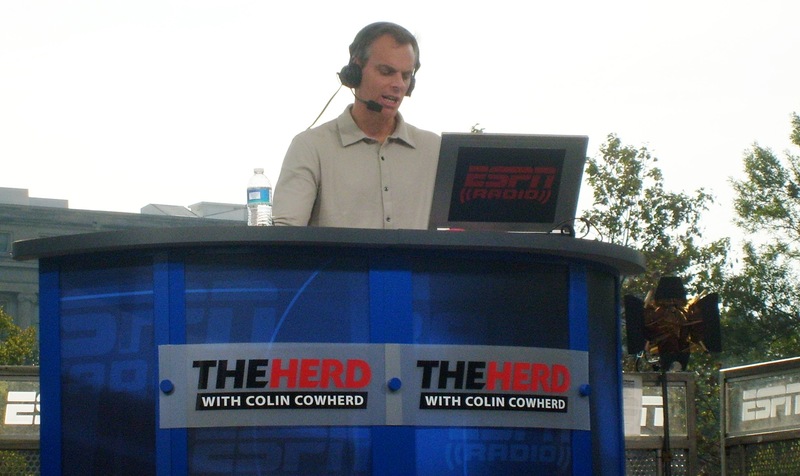 Colin Cowherd hosting “The Herd.” Courtesy of Wikimedia Commons. Not only am I proud to be from the Dominican Republic, but it is an honor to be representing the DR in Major League Baseball. Unfortunately there are hardships that do exist for people of every background, and in some circumstances, yes there are “educational hurdles.” However, there is a difference between that and ignorance or stupidity, which I believe was implied. SB Nation editor Tom Ziller joined the pack, describing the rant as Cowherd’s “racist piece de resistance.” SB (Sports Blog) Nation is a sports network primarily driven by part-time contract writers, a conglomerate of over “300 individual fan-centric sports communities.” The verdict of the court of public opinion was swift and concise: Major League Baseball, players, and fans weren’t buying it. Those who listened to The Herd know there is no love lost between him and baseball; Cowherd is a self-professed “football guy.” The celebration of football and the White masculine leader – the White coach – as the cultural ideal predates his show. Indeed, the sport’s popularity as America’s favorite pastime, a title earned during the Cold War when it supplanted baseball as America’s premier spectator sport, is a product of the game’s historical relationship to masculinity, race, citizenship, and war. At the turn-of-the twentieth century, football served as a powerful metaphor for leaders like Theodore Roosevelt who were concerned with the overly refined culture and its effects on White manhood. Roosevelt championed college football above all other sport because of its militaristic qualities and preparation of college-aged White men for war and, consequently, national leadership. He took such an interest in the game that when violence threatened the integrity of the sport, he invited delegates from the eastern establishment – Harvard, Yale, and Princeton – including the “father of American football” Walter Camp, to the White House in 1905 to encourage fair play. Roosevelt remains significant to the legacy of American football because some histories, including the National Collegiate Athletic Association’s (NCAA), have attributed the formation of the organization to him and these meetings. In his flawed analysis, or lack thereof, of the intersection of race, class, and sport, Cowherd pivots his reductive opinion on a matter of geography. The “educational hurdles” that impacted Dominicans and thus the cerebral nature of the game were “Third World” problems, a term loaded with racial and geographical privilege. The stereotype inherent in this argument is that such hurdles do not exist in the United States, although the National Urban League’s 2015 State of Black America Report shows educational inequity as a primary concern of the African American community. Historian and cultural critic Robin D. G. Kelley has explored how economic and “educational hurdles” have impacted the advancement opportunities of urban Black youth. Although his work looks at the end of the twentieth-century, it remains timely in showing how the segregation of Blacks into certain neighborhoods and schools make play (and other forms of social expression like music) a more reasonable, if not unrealistic, form of advancement than education. In urban America, then as in now, Black (and Brown) youths aren’t often given the tools and breaks to overcome “educational hurdles,” so they focus on clearing actual hurdles instead. Sport becomes a way out for them and their families. Kelley’s work, like José Bautista’s statement, reveals the flawed conflation of race, class, the Third World, and baseball that drives Cowherd’s assessment of the game; a lack of a degree or advancement educationally does not necessarily determine what one knows but may be, quite simply, the result of different available paths with more advantageous economic outcomes. In choosing Belichick, in contrast, to uphold football as the “thinking man’s game,” Cowherd plays upon another mythology, an ideal of football that makes it most fit for the shaping of national leaders and White men as most fit for the sport. The question his herd of critics must ask then is why in 2015 some sports fans like Cowherd are still more comfortable with this sport and the White coach as the cultural ideal, as the best American sport has to offer? It is of interest, for example, that the mind behind the NFL machine is Belichick over that of Seattle Seahawks’ Pro Bowl cornerback Richard Sherman. Sherman gained national attention in 2014 for his epic trash talking of a San Francisco 49ers player at the conclusion of the NFC Championship Game. He received widespread condemnation for his “thug” behavior by media and fans. The day following the game, in fact, the word “thug” was used 625 times on television, more than on any other day in the past three years. The NFL is not the only gridiron where White men rule. The 2014 Racial and Gender Report Card for College Sport revealed that the Football Bowl Subdivision (FBS), the top level of college football, employed only 14 Black head football coaches at the start of the 2014 season. This was a decrease of one Black head coach from 2013. To put that in perspective, the league employs 14 Black head coaches out of 128 teams. All FBS conference commissioners in 2014 were White. Such numbers exist despite an increase in athletes of color at the college level since the 2008-2009 season, with the largest percentage of Division I players as Black at 46.9 percent . Cowherd addresses none of these color lines in his analysis of American baseball and football. The stereotype that Latino ballplayers are dumb is not new. Part of it arises from the different ability levels of Latino players to communicate in what is for them a second language, English. However, finding it difficult to acquire bilingual skills is not a sign of a lack of intelligence, but involves active learning and attempting to adapt to living in a new society all the while trying to make it to the major leagues (and stay there). Ironically, many of the sportswriters and broadcasters who have poked fun at the accents and halting English of Latino players do not themselves speak a second language. Cowherd would go on to argue in his defense of Thursday’s broadcast that what showed the lack of “thinking” necessary to play baseball was the multilingualism present in the game. Men from different countries who presumably did not speak English could play together. This stereotype, of course, assumes that such men could not speak English, or learn certain elements of the game in a standard language to perform. As Burgos, Jr., shows, Cowherd does not have to consider such possibilities in his assessment of race, class, geography, and sport because of his place in a racial and gendered hierarchy that privileges monolingualism. Burgos, Jr.,’s work is also significant because it shows that non-White men are not just a side note to American sport and sport history, or people to be ridiculed in an attempt to uphold another sport as the “real” American pastime. As Bautista and Sherman’s play and commentary shows, among thousands of others, they are the American sporting landscape. It is only in appreciating their contribution that we as scholars, journalists, and fans can fully deconstruct it. Cowherd’s failure to do so shows less about the Dominicans he stereotypes and more about his relationship to a cultural ideal and that ideal’s relationship, through Whiteness and masculinity, to power. At the heart of his critique stands a stereotype of American football that celebrates White masculine leadership at the expense of Black play, an ideal as old as the sport itself. Still, Cowherd was right about one thing. Critics, he proclaimed, should take on his full statement. We must do so to show how the denigration of the non-White ballplayer is in conversation with the reverence for the White male coach; you need the first to ensure the job security of the latter. In breaking with his herd of critics, we have the potential to show how the archetype of the White coach, like the stereotype of the Dominican player, is deeply flawed. Both require a more nuanced understanding of race, class, geography, and sport history, and the thoughtful men (and women) of all races who continue to take the field. Kate Aguilar is a Ph.D. candidate in History at the University of Connecticut where she studies racial formation, gender, sport, and political culture in the post-1945 U.S. Taking as a lens the University of Miami’s football team, the Hurricanes, her dissertation analyzes the central place of the sport and the city to the 1980s development of the New Right; a focus that makes evident the significance of the Global South and the diverse racial, national, and transnational histories of South Florida and the Caribbean to Ronald Reagan’s particular brand of conservatism and the masculine national identity it fostered. She can be contacted at katelyn.aguilar@uconn.edu. Throughout the article you bring up the differences in the representation of minorities compared to that of Whites in professional sports, mainly the NFL and MLB. You touch on the Rooney Rule, but just to briefly mention it. I have done a little research, and looking at the 2014 The Institute for Diversity and Ethics in Sport (TIDES), as you stated the overall reviews are mixed, but it appears that the Rooney Rule has made a positive difference in the leadership opportunities for minorities in general, not just African American men. You focus your energy on coaching, where there are currently 5 minority coaches, I think it may be even more interesting to look at the NFL as a whole. Where are the minorities in upper management positions, such as GMs, VPs, and owners? According to the TIDES report, there is only one minority owner of color in the NFL. To me the mere presence of the Rooney Rule, seems to point to a large problem in professional sports; albeit the League appears to be addressing the situation head on. I was wondering your thoughts about the apparent lack of diversity in other leadership positions in professional sports. I was listening to Colin Cowherd’s show the morning this particular foot in mouth incident happened live and I remember stopping cold and thinking, “oh man, I bet he wishes he had that one back.” My initial visceral reaction was mainly to his obviously negative assertion about the intelligence of players from the Dominican Republic, but your essay peels back an interesting and legitimate second layer of concern regarding the host’s obviously deep-seeded beliefs pertaining to the intelligence necessary to play or manage in professional baseball versus playing or coaching professional football. The percentages being as stark as they are, when you look at the number of black head coaches in comparison to the concentration of black players in the NFL, it’s obvious the Rooney Rule has only seen limited success. I think you can take this one step further to what most would consider the most cerebral position on the football field – the quarterback. While there has been a slight uptick in the number of black quarterbacks in the NFL over the last handful of years, they’re still in the fierce minority. Outside of kickers, punters and offensive lineman, quarterback is probably the only position where African Americans are so underrepresented. Which begs the question that you proposed about us knowing Belichick is a great coach because he got the chance to prove it (twice actually, after initially failing miserably in his first head coaching gig at Cleveland). Have there not been that many great black quarterbacks in the NFL because they simply didn’t exist, or was it prejudices and preconceived notions about their capacity to excel in the mental side of the position that simple froze a majority of them out in the cold?